This week’s newsletter looks at the optimum formats for email communication. While HTML still seems to be the format of choice for email communicators because of its design capability, there are smart ways to ensure that you don’t miss some of your target market because your email may get blocked or stripped. With the digital communication landscape constantly changing along with networking and software developments, it’s imperative to keep aligning your email communication strategy with the ultimate goal: getting your emails through and making sure they get read by the recipient. Much research has been done into the format an email should be sent in, in order to: A) ensure delivery, and B) get the best possible read-rate and response. As a presentation format, HTML is by far the preference of email marketers. You can design creatively in HTML, use graphics and adhere to corporate identity guidelines. HTML can be used to present creative concepts, and reinforce brand values. Of course there’s a ‘but’. Because HTML uses graphics, and graphics could, for example, contain viruses, many administrators do not allow their users to receive HTML-based emails. On the other side of the spectrum is the plain text email. This is not a favorite of marketers because it doesn’t allow any design. No pictures, no colors, buttons, tables or banners. Plain text, however, is the most likely of formats to actually get delivered to the recipient. It may not be pretty, but it is functional. 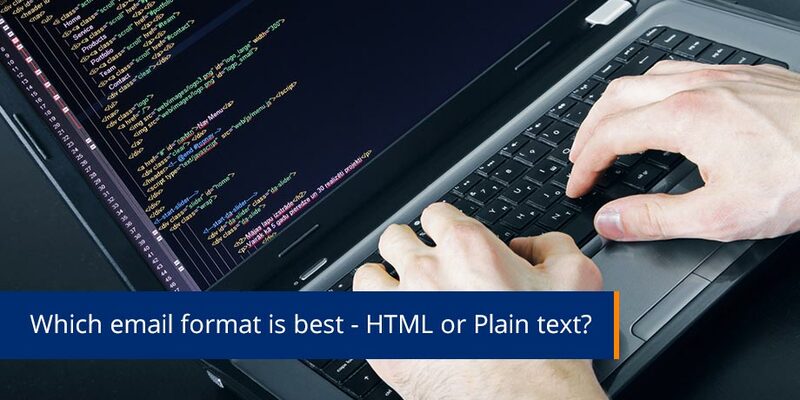 So which format does the marketer choose – HTML or Plain text? Email practices have developed sufficiently to enable the marketer to utilize the strengths of both formats. Maintaining this level of sophistication requires building up skills and paying constant attention to delivery trends. Before sending out an email campaign, you should be segmenting your email recipients into those domains that allow HTML emails and those that do not allow HTML. This means that each communication you create will have two formats, the HTML format for one set of recipients and the plain text format for the other set. If you are unable to segment your recipients against domain names, then you need to send what is called a Multipart email. This is an HTML email, with an embedded plain text version. If the recipient machine rejects the HTML, it should allow your well formatted plain text email to go through. The hardest part of this process is maintaining your messaging rules and keeping constant watch over your email delivery reports to spot domains that are rejecting your HTML emails. In some cases, it is not the domain that restricts the HTML rendering, but the recipient’s email client. Managing this process means a personal relationship with the email administrators of the large domains and ISPs. On the HTML side, there is also the debate around Linked or Embedded images. Linked images are better for business domains, while embedded images are better for dial-up domains. It’s unlikely that email administrators at large organizations will allow a .jpg or .gif image through their security, but they will allow a pull-through of that image from a web server. A recipient using a dial-up account may download their email and then disconnect from the Internet. If they read an email that has linked images after disconnecting, the images will appear broken. Therefore it’s better to embed your images for dial-up domains, while keeping the size of the email as small as possible to minimize download times. It’s not a question of doing one or the other at this point, it’s a matter of refining your process to offer both, depending on what the recipient can, or wants to, receive. However, with the changes coming down the line in email clients, the landscape will be different in 6 months time, and email communicators will need to be constantly adapting to maintain high delivery rates. Email volume in the United States is projected to nearly double from 1.5 trillion in 2003, to 2.7 trillion in 2007, as reported by eMarketer.